South Manchester CAMRA (I think), which is my local branch (at least, I think it is; Manchester is divvied up between about eight different CAMRA branches, most of which don’t seem to correspond to areas people are actually likely to say they live in – “Trafford and Hulme”, I ask you) – anyway, South Manchester CAMRA is running… I’ll come in again. South Manchester CAMRA is running a Winter Warmer Wander, in connection with the upcoming National Winter Ales Festival. (It opens on 19th January and I’m looking forward to it already, Christmas schmistmas.) The deal is the usual kind of thing – visit up to 32 designated pubs in the area and “Buy at least half a pint of cask conditioned stout, porter, old ale, barley wine (or if none are available any other premium beer at 4.5% abv or greater)”. Twelve stickers get you two bottles of winter ale and a free ticket to the NWAF; prizes for visiting 24 and all 32 pubs are yet more generous. Eight of the 32 pubs are in the city centre, if we define “city centre” to include a brisk hike up the Rochdale Road, so I thought there were some relatively easy ticks to be had. I started at the Waterhouse, one of the many Spoons houses in the centre, and probably my favourite; certainly it’s the one that’s most like a pub and least like an old-school Yates’s or a Butlin’s canteen. Getting served on the weekday lunchtime when I visited was a bit of a challenge, as the serving area was dominated by a long queue of people ordering food; I joined it on general if-you-can’t-beat-’em principles (a queue, in a pub?) but then spotted a group of drinkers loitering by the bar and went to loiter nearby. Sadly, the pub had no beer – I jest, it had several cask ales on, but none of them qualified as a “winter warmer”. What they did have on was Jaipur – well clear of the 4.5% threshold and, if ultimately not really my thing, a very nice example of its type. Very much Dobber’s smartly-dressed cousin; Dominic should fit right in over there. Further into the town centre, the winter warmer drought continued. Nothing at Bar Fringe, where I had Blackwater’s oddly-named Disco; a perfectly decent north-end-of-session-strength pale bitter, but no more. Nothing at 57 Thomas St, partly because I literally couldn’t get in the door – someone seemed to have had the brave notion of taking an entire office party there. The numbers could have got lost in the Waterhouse; at 57 Thomas St, they gave the entire pub the density of a moshpit. I went on. Nothing at the Castle, where the Old Tom clip was turned round (and none of the ales that were on broke the 4.5% barrier). Nothing at the Arndale Micro Bar – at least, not until I remembered that one of the regulars there is Boggart Rum Porter, and what a very fine beer that is. And nothing, again, at 57 Thomas St, where I managed to get through the door an hour or so later; the range was the usual – Bitter and Dobber. The latter would have qualified, but the pub was still unpleasantly crowded and noisy, so I left it. Another venture into town took me, warily, to the Smithfield Hotel. If you go to Band on the Wall and keep going – where the road heads away from Piccadilly and towards Victoria, and very rapidly starts looking highly run-down and a bit dodgy – you’ll reach the Smithfield. And reach it you should, because it’s a really nice pub with a great range of beer. I had Facer’s Winter Warmer: a beautiful 7% barleywine, mellow and smooth, heavy without being sticky. Emboldened, I made a return visit to the Castle, where the Old Tom was back on, and what a very, very fine beer that is. I had a half, and even that was enough to make me (a) lose all track of time and (b) not care. It drinks its strength in every sense: a firework display of flavour to keep pace with the 8.5% alcohol hit. Wonderful stuff. Then it was back to 57 Thomas St, which was more or less empty and could only offer Bitter. (Shape up, lads – I don’t think a choice of two ales is a lot to ask.) Finally, I found myself at the Paramount, another Spoons house and one which I’d strenuously avoided up to now. The seating is plentiful, as always with JDW – you’ve got to have something to sit on while you eat your burger-and-a-pint – but the place somehow still gives the impression of being a “vertical drinking” pub; something to do with the combination of an open-plan layout, plate glass windows and low lighting. That, and vast hordes of punters – the place was absolutely rammed. I’ve never known a Spoons that was a nice place to drink, and the Paramount is no exception. On the other hand, I’ve never been disappointed by the beer on offer, and the Paramount came through on that front as well. Step forward Paramount Porter (! ), which is 6.5% and brewed by Elland – and is presumably a rebadged version of the 1872 Porter which was Supreme Champion at the 2010 Winter Ales Festival. And rather fine it was. Seven pubs, six beers, including three excellent “winter warmers” and one absolute classic. Six down, six to go – Chorlton is calling! This is a late addendum to last weekend’s Open It! jollifications. As you can see, I didn’t have any beer at the back of the cupboard that I wanted to broach for the occasion. (I have got four Marble 750ml bottles awaiting their special occasion – the first four, that is: Decadence, Special, Decadence Frambozen and Decadence Kriek – but by the time I started thinking about Opening It! it was Sunday evening, and I really didn’t want to start putting myself outside that much alcohol. Their time will come.) Instead, I dug out what you can see in the picture. Lindisfarne sloe gin. This was a bit of a cheek, as this bottle was actually a present to my wife a couple of years ago. Still, she’d forgotten about it, so I thought it qualified (and she had a glass too). In the event, this gave us both a surprise. It was a deep purply red, it was thick and syrupy, it was sweet with an underlying bitterness… and it was sharp: not the slight fruity sourness of a ruby port but a real acidity. Much sharper than we’d expected, and not entirely successful. 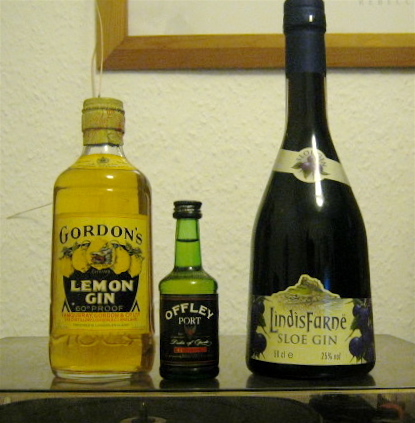 Gordon’s lemon gin. I guess this is also strictly speaking my wife’s property, as it was one of the things cleared out of her mother’s house when she went into a home. She (wife, not mother-in-law) remembers it sitting unopened in the drinks cupboard from her early childhood. Gordon’s stopped making lemon gin in 1980, so it’s at least 30 years old; from the look of the bottle I’d say it’s closer to 50. The strength is given as 60 degrees proof, which I reckon to be 34.5 % a.b.v. So what’s it like? According to this ad what you get is “the purest gin blended with the juice of the finest lemons”, which sounds like a pretty full-on combination. On tasting, it became apparent that there was sugar in there too, although doubtless they insisted on the purest (or finest) sugar. At first it reminded me of limoncello – it could hardly fail to, given that it’s sweet, strong and tastes of lemons – but as I got further down the glass the gin flavours and aromas came through more insistently, a bit like hop aromas sneaking up on you when you’re drinking a malty beer. Really very nice indeed. I subsequently tried a lemon gin and tonic; this wasn’t as successful – a bit too sweet – but I could easily acquire the taste. If only it were still available! So that’s the set-up: what about the punchline? I should say that I wasn’t expecting very much from the Offley: apart from anything else, the label clearly states that this is a miniature of Ruby Port, which isn’t normally known for losing its colour in two decades flat. First impressions were actually quite good: it looked a lot like white port and tasted pretty similar, with perhaps a bit of the ruby port blackcurrant flavour coming through. My mistake was to swallow: the aftertaste, and the aroma it seemed to release as it went down, were truly vile. I’d never fully appreciated the concept of a drink smelling “musty” before. This port didn’t just have musty overtones, it genuinely tasted like old books smell. Regretfully, I poured the rest of it down the sink. But at least I can say that I Opened It – and, in at least one case out of three, I’m very glad I did. And next year, if they’re still there, one of the Marbles gets it. This post got 1,232 views the first day it was up; the total currently stands at 2,463. That’s an awful lot of new visitors – and I think it’s probably fair to say that a lot of them weren’t too keen. I think this is more about envy of hype. Right now it is the American beers that are getting the hype and some people (especially in Europe) can not abide anything American being considered good. Just another blogger making sweepy generalizations about something they don’t like or don’t agree with. This guy’s a bummer. I wouldn’t want to drink a beer with him. this blogger is a jackass, and i wouldn’t be surprised if they work for Coors. Craft Beer….is better. Period. That’s why we love the stuff. I’m proud to have some level of literacy,culture,awareness,spirit of adventure. … Am I “Elite” probably not,but I’ve put an effort into being more evolved than the herd. What I wanted to write about was the use of the term “craft beer” in the UK, and the associated growth of a certain kind of mentality, also found in parts of the US craft beer scene. Strictly speaking, my title should really have been “Down with the use of the term ‘craft beer’ by British brewers and beer geeks; also, down with the particular kind of ‘craft beer’ mentality which this is associated with”. And what mentality is that? Firstly, “craft beer” in the UK is generally promoted as an alternative to “real ale”, the implication being that the insistence on cask ale is a shibboleth or even a bad thing; this is perhaps the main reason why the term sets off alarm bells for me (I dealt with this in this post). And (thirdly) it’s strongly associated with a focus on extremes: strong is good, hoppy is good, weird is good, but stronger, hoppier and weirder are better. I stand by my comment on the Double IPA festival Mark wrote about – it sounds like hell on earth, and it certainly doesn’t sound like a beer festival (it doesn’t really sound like beer). I would hate to see that kind of event over here, because I think it would represent a real wrong turning for the British beer scene. Which is still, primarily, a “real ale” scene, focused mainly (not exclusively) on stuff you can drink in pints, defined (mostly) in fairly inclusive technical terms. And long may it remain so. What do craft brewers do that industrial brewers don’t?